Dominic Beattie, a promising young artist and native Londoner who was recently featured in the New Order II: British Art today exhibition at the Saatchi Gallery, has come full circle to present a new solo exhibition of recent work at FOLD Gallery. Frustrated by the ‘historically-loaded’ convention of oil painting, he began to focus his practice on multi-layered compositions using a variety of cheap and readily-available material; such as coloured tapes, felt-tip pens, found objects and various fragments of fabric, paper and plastic. These were collaged and superimposed over one another in a long-standing process that saw the artist rework older pieces in the studio until they reached a state which he would feel was more or less ‘complete’. He is perhaps best known for his series of intimately scaled canvases and constructions that revel in the visual potential of unfolding patterns and unexpected combinations of colour and form. Keeping this painstaking approach in mind, it is always somewhat surprising to encounter Beattie’s work in the flesh, as it were. One is taken aback by how fresh they seem, the artist’s decisions assured and taken with an airy sense for balance and spontaneity. This is nowhere more evident than in the artist’s latest body of work. Perhaps encouraged by the space afforded to him by his studio, Beattie has upped the dimension of his work to a much larger scale. Rather than conventional canvas, the artist has decided to work on modular plywood boards that he has delivered ready made to his studio, arranging them as he sees fit for the formation of his work. This allows the artist to work across a vast space, building a pattern that suggests an ‘all-over’ effect. In doing so he recalls the classic Greenbergian tenets of abstraction and Op Art, which places value on work that can seep beyond the edge of the canvas and holds the potential for continuous expansion. These multi-layered abstractions are as much grounded in modern design and architectural principles as the pictorial language of abstraction, and such associations are made clear by the presence of similarly modular chairs arranged throughout the exhibition space. These chairs, which were made in collaboration with the architect and designer Lucia Buceta Santos, function as abstract constructions in their own right which recall (in their form and colour) the De Stijl and Constructivist movements as much as practical items of furniture upon which the viewer can sit and observe the wall-hanging pieces. 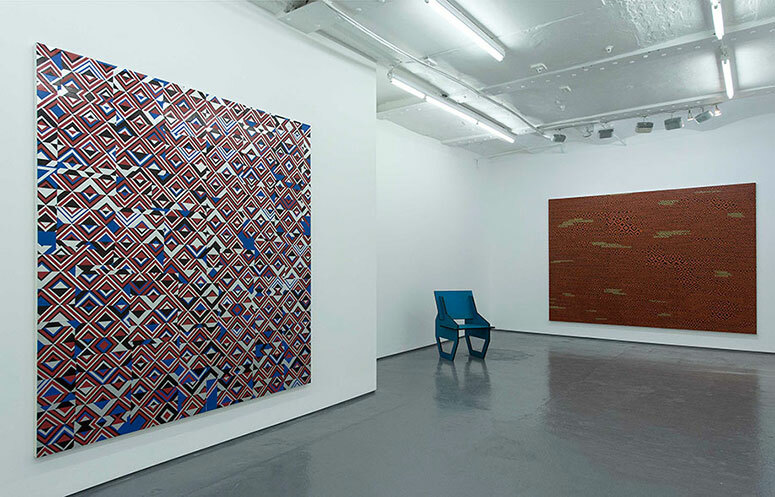 There are other elements at play; sometimes the paintings recall the decorative patterns of some Native American peoples (and in extension, that famous carpet which featured so prominently in the movie The Shining (1980), which was based on similar designs) as well as the repetitive, overlapped beats of electronic music to which the artist places his artistic process in relation. While the scale of the work has shifted, Beattie has very much kept his emphasis on the tactile nature of the material he employs. This remains modest store-bought items such as industrial tape as well as bright primary colours perhaps more associated with commercial applications. Such a notion is reinforced by the geometric grids and patterns the artist constructs, which create an optical effect of flattening the picture plane rather than an illusion of space. This is counteracted by the inevitable marks of the artistic process left evident on the work, subtle imperfections (the mark left by overlapping tape, torn edges, minor blemishes, paint leaks and blobs) which one has to actively search out in order to see, thus engaging with the work in a personal manner. These marks counteract the visual tropes of Beattie’s practice and set up a highly engaging tension between the tight framework of the composition and the physical aspect of its making. Beattie leaves the marks of his actions – cutting, layering, sticking – perceptible to the viewer seemingly as a way of affirming his presence within the formation of the work. These marks are complimented by irregularities in the matrix of the pattern that read like glitches in a system pertaining to perfection, stuttering blips which catch the eye unaware and provide a sense of something amiss. These could be variances in a pre-established order left seemingly unfinished, blank areas that reveal the materiality of the painting’s construction. In introducing these elements, Beattie seems to be willingly setting himself up as the architect of a futile project; a flawed attempt at constructing a cohesive whole in a chaotic world. The viewers eye is forced to look, to engage with the pictorial surface and observe its uneasy fluctuations and variations, rather than settle and rest into an abstraction that flirts all too easily with decoration. In this way Beattie charges his work with a truly unique voice, one that seems to come out of a mileau of sources and inspirations yet sings its own strange song.